After our first day trip to Mexico and the problems we had leaving the country, I wasn't sure if I ever wanted to return, but time has a way of mellowing out our memories, and we knew that there were many wonderful things about our neighbor country that we really wanted to see. It's just too close to Belize not to check out, and we'd been studying Spanish (via Pimsleur audio course) off and on over the past year, and wanted to have a chance to try out our rudimentary skills. Plus, by staying over a week, we knew the exit fee was expected and not a scam. So, we planned a bus trip that would have us staying in five different cities over a two-week period and venturing west from the Yucatan Peninsula up into the dry highlands of Chiapas. We'd hoped to make it to Oaxaca as well, but the long bus rides there and back would have lengthened our trip by too much, so we'll have to save that one for another time. We'd bought our tickets for the 8 am ferry to Chetumal and taken Paisley to the Pampered Paws for boarding the day before, as we wouldn't be able to get her there before the ferry departed. We had to catch a very early Coastal Express water taxi from the Grand Caribe dock the day of our travels, which left us plenty of time to walk over to Water Jets International and to wait for them to officially open so that we could go through immigration to check out of Belize. Fortunately, the security guy let us wait on this bench on the lagoon side of the island by the dock. We were the first ones there. Here was our ferry to Chetumal. In addition to the usual $7.50 BZ Belize port fee, there is a new $30 BZ ($15 US) exit tax that must be paid by all non-residents when leaving Belize by boat since the last time we went to Chetumal. Grumble. Fortunately, the boat wasn't very full, so it was a comfortable ride over to Mexico. We had taken the competing ferry line last time, and this one, while a bit more expensive ($75 US per person), had a few more luxuries. Better (padded) seats, a complimentary cookie and glass of juice, and even a DVD movie! Note: Currently the two ferry companies alternate days going to Chetumal, and we found out on returning that that alternation is not just a slow-season thing (as we'd assumed) but will continue indefinitely. Something important to know when planning a trip for a certain date, you have to know which company will be running that day, especially since the other company's dock is on the sea-side. You don't want to end up at the wrong dock without enough time to get to the other if need be! Once we arrived at the Chetumal dock, we had to go through the drill of having our bags checked by the drug-sniffing dog, accompanied by the Mexican police with machine guns. It's a bit intimidating since there's certainly no such procedure when arriving in Belize, but we had nothing to hide. Still, we joked about how the dog smelled something in Barry's pack last time, so its contents had to be inspected; and believe it or not, out of all the bags from passengers on our boat, the same thing happened again this time! This time it was his waist pack containing all his toiletries, and the police paid verrrrrry close attention to a bottle of OTC melatonin, but fortunately, they found nothing suspicious and finally let us go on our way through customs and immigration. We were advised of the exit fee on our way in this time, a process improvement since our last visit, and it was the same $25 US (or approximately $300 MX) as the time we only spent a few hours on Mexican soil. We grabbed a taxi ($50 MX, about $4 US) over to the bus station and bought our bus tickets to Tulum. We ended up on a second-class Mayab bus. This was to be our only second-class bus of the trip, but we just wanted the next bus, and that happened to be what it was. I got to use my Spanish right away as the ticket seller spoke no English. Fortunately, we'd written up a little cheat sheet of common phrases that we might need for purchasing tickets, checking in at hotels, and ordering in restaurants, so I was able to do so without too much difficulty. Plus, they show you the screen as you are buying your tickets, so you can point. That always helps clarify things! Despite being a second-class bus, the Mayab was far nicer than the "chicken buses" we're used to taking in Belize. It was luxurious by comparison, with plus seats, air conditioning, and curtains on the windows. Since it was a second-class bus, it stopped quite a few times, and in some cases, local vendors would enter the bus briefly to sell their wares. Being hungry for lunch, we bought this delicious pastry that ended up being filled with apples, cheese, and thinly sliced ham. Let the eating begin! And I bought this chicken salbute for Barry. The pink pickled onions on top are very popular in Mexican cooking. Both items were extremely cheap! We were loving Mexican food already. After a little over three-hour bus ride, we arrived at our first destination, Tulum, where we'd be spending our first three nights. Mayab second-class bus -- very nice! It was only a few blocks walk over to our hotel for the next three nights, the Secret Garden. It was a real oasis right in town with many beautiful trees creating a cooling garden setting even on a warm, sunny day. We were greeted warmly by Maura and Joshua, both of whom spoke great English. Joshua gave us lots of good information about Tulum, along with an excellent map of the area. After a quick change of clothes, we wasted no time in setting out to start our explorations of this little beach town we'd heard so much about. Stay tuned for much more on Tulum: the ruins, the beautiful beach, the town, and (of course), the FOOD! If you read our last blog post, you'll know that I'd written a note to Angela and Tony explaining how early we needed to leave in the morning and that we wouldn't have time for breakfast but would like some coffee. I also asked them to please call us a taxi to get us to the bus stop in the village by 7 am (the only other bus is in the afternoon). And Barry planted the note in the gate to their apartment upstairs from their restaurant as they were out to eat in town when we went to bed, early. Fortunately, they did find the note. When we got up on Saturday morning and ventured out, I saw Angela, and the first thing she said was "we got your note". Relief! She also said that Tony would run us up to the bus stop, which was great. We finished our last-minute packing, enjoyed some good coffee, and I signed their guest book before we left. Tony was on the phone, so Angela ended up giving us a ride to the bus stop, which was much appreciated. Actually, we ran into the bus on its route so got on before the stop, which was good as it ended up being packed. Who knew this bus would be one of the most crowded ones we'd been on here? We made a really bone-headed move on this bus trip, however. Where the road split to go to Dangriga, the bus driver announced that people wanting to go to Belize City could get off at the intersection and catch another bus (instead of taking the bus all the way to Dangriga, then catching another bus and backtracking down the road to Belmopan and ultimately Belize City). We decided, like lemmings, to follow a bunch of locals who were getting off there, thinking we could just catch a bus to Belize City at the intersection to save time. It was a good idea in theory, but not so good in practice. Every bus that passed was either heading south towards Placencia and Punta Gorda, or was already full and wouldn't even stop for us. We finally realized that catching a bus after it left the Dangriga stop, if it wasn't too crowded to stop for us, would actually make us later than if we'd just stayed aboard the first bus all the way to the station. And we might end up missing the water taxi we intended to take from Belize City to San Pedro and have to take a later one. Finally, a bus from down south heading towards Dangriga showed up at the intersection, and we all ended up running across the street to board -- only to go exactly where we would have gone on the first bus, and later, to boot. D'oh! We learned a valuable lesson about sticking to our plans rather than "following the crowd". We felt like even bigger fools when we arrived at the bus station only to realize that the bus we were supposed to switch to was an Express to Belize City so was much nicer (and air-conditioned!) than the one we were on and had just paid for. Double d'oh! Quite a few additional passengers boarded the bus in Dangriga, and it stopped to pick up multiple people along the way. Soon the bus was standing room only. When we got near the Belmopan bus terminal, all the standing people had to crouch down in the aisle so the terminal authorities wouldn't see that we were pulling into the station carrying excess passengers. Enroute to Belmopan, before the "big crouchdown"
They must really be cracking down at the Belmopan terminal as our bus was delayed leaving the station due to too many people on board, and the authorities would not let us leave with three adults in any seats. Three (or even four) in a seat are allowed, but only if the third (and fourth) are children. There were two seats in our bus with three adults, ours being one of them when a local perched on the very end of our seat. The terminal authorities entered the bus and and said that the two excess people would have to leave. Normally, pretty much anything goes here in Belize, so when the authorities start to enforce some unpopular regulations, the citizens don't like it one bit. Lots of angry yelling from the peanut gallery ensued, in Creole, so we couldn't understand all of it, but we certainly got the gist, along with plenty of cursing. We definitely agreed with the sentiment we heard expressed that there should be more buses if they weren't going to let people stand in the aisles or ride three-abreast. So few locals in Belize have cars that public transportation is heavily used, and it seems like the buses and the water taxis are both fuller than they should be at times. The folks running these have gotta be making money! Finally, with a little creative seat rearrangement of some of the children and the two adults in question, the bus was allowed to leave the station en route to Belize City, but we still weren't sure if we'd manage to make the noon ferry back to San Pedro, much less stop at Brodie's for a few groceries to save money over San Pedro prices as we'd planned. We had only ourselves to blame for getting off the bus when we did. Fortunately, all's well that ended well. Our bus driver must have really made tracks to make up time, as we got to Belize City in time to make a VERY quick Brodie's run and to make the noon ferry. We had a list for Brodie's and were in and out in five minutes, a record. When we got to the ferry terminal, they were already boarding the boat. When we got up to the ticket taker, he told us and the others behind us that the boat was full and that they were going to have a second boat to take the overflow. We got on a second smaller boat, which looked like would be almost empty, but it took so long to leave that more and more people kept coming up and boarding, so it ended up packed to the gills as well. And when we got to Caye Caulker, we had to switch to the original larger boat after it unloaded its Caulker-bound passengers. It was very crowded, and we had to sit on top of the hot engines, slightly melting the chocolate chips we'd purchased at Brodie's. But we made it back to Ambergris Caye/San Pedro. Once in San Pedro, we had to walk over to Pampered Paws to pick up Paisley, who jumped up and down behind the doggie fence when she saw us -- boingy, boingy, boingy -- without making a peep, just jumping. Wish I had video of that! Fortunately, Pampered Paws did post these cute photos of her playing while she was there on their Facebook page. It always looks like she has a great time there. We had to wait the obligatory half hour before the water taxi north took us home to Grand Caribe, and it was packed, as usual. A very uncomfortable ride with our backpacks, groceries, Paisley's luggage, and Paisley; but we made it home in one piece, exhausted but happy. We also vowed not to travel again on the first day after school lets out for the summer, as it seemed like every Belizean in the country was traveling that day. We can definitely recommend Hopkins as a relaxing, beautiful place to visit if you're in Belize, and Beaches & Dreams as a wonderful place to stay. We hope to get back one day to try to hike the trails we missed (or didn't quite finish) this time. Antelope Falls will continue to haunt us until we summit the waterfall! In keeping with our quest to spend time seeing different areas of Belize, we decided to take a short trip to the village of Hopkins in the Stann Creek district during the last week in June. Since rainy season is officially here, and actually began early this year (May instead of June), we weren't sure if we'd end up getting to do all we wanted to, but as it turned out, we ended up lucking out with a perfect week to travel and only a brief sprinkle of rain the entire time we were away from home. Hopkins is a small Garifuna fishing village on the coast of the Stann Creek district of Belize, south of Dangriga and north of the Placencia peninsula. This map shows where we live on Ambergris Caye (just south of the Yucatan Peninsula of Mexico) in relation to Stann Creek and Hopkins. Most Belizeans who live in Hopkins were born and raised here, and there is a strong and proud tradition of making music involving drumming, dancing, and rattles. There are local crafts created in Hopkins such as wood carving, and small restaurants offering traditional Garifuna food. There are small guest houses, beach cabanas, and upscale resorts catering to tourists. 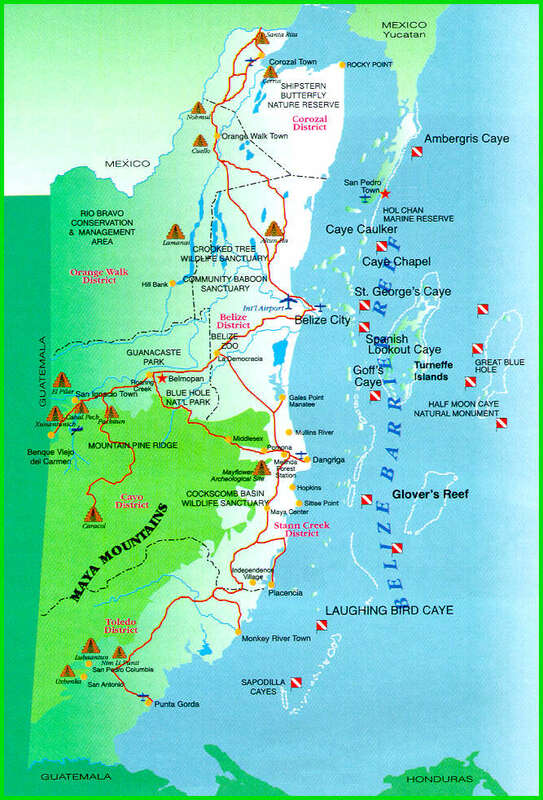 There aren't any chains -- stores, restaurants, or lodging, which is typical of Belize. But let's back up a bit -- first we gotta get there. Since we try to travel frugally, this journey took a lot longer than the mileage from Ambergris Caye to Hopkins Village would indicate. We started with the 9:50 am water taxi from Grand Caribe to San Pedro, loaded down with our backpacks and with Paisley and her gear in tow. After dropping Paisley at Pampered Paws for boarding, we had a little free time before catching the 11:30 ferry to Belize City, so we walked to Lily's Treasure Chest on the beach for a late breakfast. This is only the second time we've eaten breakfast at Lily's, but we have gotten great meals both times. Their Huevos Rancheros are the best I've had anywhere. Yum! After breakfast, we headed over to the ferry dock and were pleased to see that they were offering a June Special. $10 BZD ($5 US) off the normal round-trip fare. Worked for us! While waiting for the ferry, a huge stingray appeared in the crystal-clear water beside the dock. It was fun to hear the local children excitedly checking it out. We big kids enjoyed it as well! We ferried to Belize City and since we didn't have a really tight connection, we decided to walk to the bus station. We've been to the city enough now that we've gotten much more comfortable walking around there than we were on our first visit, and Barry remembered the way to the station. This saved us the $10 BZD taxi fare, and we knew we'd be sitting so much that we appreciated the exercise. We didn't even get hassled by panhandlers this time! We had planned to take a James bus leaving about 30 minutes after we arrived at the terminal, but when we arrived, there was a G-Line bus just about to leave for Dangriga, so we hopped on that one instead. This worked out just fine. It's a long journey, stopping in the capital city of Belmopan, then continuing on the scenic Hummingbird Highway over the very pretty Maya Mountains. This is the same route we took to go south to Placencia in the winter. This bus kept us entertained with plenty of music and even a video screen -- that was a first for us. The bus ride cost us just $10 BZD each ($5 US). Most Belize buses are old US-made Blue Bird school buses. Not very luxurious, but cheap! In Dangriga, we had to catch a different bus to Hopkins. The Hopkins bus only runs twice a day, once in the morning, and once at 5:15 pm. We met a nice couple in the bus terminal who were staying in Hopkins as well and chatted with them for awhile -- we ended up seeing them later in the week as we biked around the village. The bus ride to Hopkins cost $5 BZD each and took under an hour. The last four miles into Hopkins Village on a mostly unpaved road were quite an adventure. This road has definitely seen better days, and between potholes, big rocks, and washboarding, took a long time to traverse. I can only imagine how muddy it is when it is raining. After entering the village, the bus driver took a circuitous route dropping locals all over the small Garifuna town, some right at their modest clapboard homes. What a difference from San Pedro. Hopkins has nearly all unpaved roads and very little commercialism. There were a couple of other backpacking tourists getting off at some inexpensive lodging in the north part of town as well. Tony and Angela, proprietors of Beaches and Dreams, where we were going to be staying, had told us to have the driver let us off at Innie's Restaurant, where they would come pick us up. Innie's is a small local restaurant serving up authentic Garifuna cooking, and I was excited to try the hudut, which I'd read about beforehand. This traditional dish consists of a whole fresh red snapper cooked in a delicious homemade coconut milk broth, traditionally served with a soft green plantain dumpling for dipping. As we were getting a drink and relaxing at our table, Tony and Angela stopped by our table to let us know they were there, but would be taking a walk and picking us up after dinner. Right after they left, two van loads of high school students and teachers rolled up. So much for our quiet dinner! Actually, they were quite well-behaved considering how many of them there were. Barry tried the Belizean stewed chicken with stewed beans and rice, which he loved, and I enjoyed the hudut. It would be nice to have a few veggies with this meal, but that was all that was missing. Otherwise, it was delicious! After we finished our dinner, Tony and Angela drove us down to Beaches and Dreams, a couple of miles south of Hopkins Village at False Sittee Point. It is located in the same area as several upscale, expensive resorts but is a more laid-back, casual place and proved to be a perfect choice for we frugal travelers who didn't want to spend $200 a night for lodging. There is an excellent restaurant on site, Barracuda Bar & Grill (#1 rated in Hopkins on tripadvisor.com), where Tony is the head chef and Angela bakes all the wonderful desserts, but they told us that it was closing this week for a couple of months during low season. We were disappointed with this news; however, Tony said we were welcome to attend a Tapas fundraiser the following night (Wednesday) and also offered to cook for us on Thursday night. That would work! It was already pitch dark by the time we arrived, so we couldn't see too much of the grounds or the beautiful ocean very well, but here are a few shots of our room, the "Scarlet Macaw" (Room #3 of only five rooms at the inn). Since we weren't able to see actual Scarlet Macaws when we visited Red Bank, the many brightly colored, painted birds in this room were the next best thing! Nice large tile bathroom and a ceiling fan! The room was quite large and comfortable, with a decent-sized bathroom. The clothing armoire, water dispenser, and sofa were great additions, as were multiple hooks on the walls for hanging damp clothes. There was no TV nor A/C, but three fans and lots of slatted windows for ventilation kept it comfortable. The only addition that would have made it totally perfect would have been a dorm-sized fridge to keep beverages cold, but Angela kindly brought us a small cooler of ice. I drank about six glasses of ice water that night after all our travel on a warm day! We hit the hay early as we were exhausted after our day of travel. Our reasonable low-season room rate of $75 US included breakfast cooked by Angela, so we looked forward to that in the morning before heading out to Bocawina Mayflower National Park for some hiking and bird-watching. We'd been wanting to go to Belize City for awhile to do a little shopping, since availability and prices of goods are reputed to be better than on Ambergris Caye. We'd also been wanting to try the ferry, as we've always taken Tropic Air to and from the airport on our trips here, so Friday seemed like a good day to have a little adventure. I was a bit wary of the city (often called simply "Belize" by locals), having read about the crime there, but we got some good recommendations online. These included this highly informative blog entry entitled "How to Survive in Belize City" (http://www.sinnvollereise.de/?p=1368) and this commercial site, which is refreshingly honest about some of the less desirable sides of the city: http://www.belize.com/belize-city.html. Seems if we stayed on certain streets during the day, we would be okay. Still, I insisted on preparing a "give-away wallet" (recommended in the blog above) with an expired credit card, some other expired/unusable cards, and a small amount of money, just in case. Although we'd planned to go Friday, we kept wavering as the weather looked dark and threatening down south, but after watching the online Doppler radar for a bit, it appeared that most of the rain would have passed through already by the time we got there, so we decided to go for it. We grabbed our backpacks, water, rain jackets, and camera, and walked the roughly two miles to town to the ferry terminal. We were running a little late due to some neighborly socializing outside our building, so we had to make tracks, and it was awfully hot in the bright sunshine on the way, but we made it in time and paid our $55 BZD ($27.50 US) per person for round-trip tickets. The ferry over was not too crowded, and the sea was glassy most of the way, making for a nice, smooth ride. But as we closed in on Caye Caulker, the only stop along the way, the skies turned dark, and we hit some fairly heavy rain. It was kind of neat to watch the sky and sea change from the comfort of the covered ferry. By the time we arrived in Belize City, the rain had stopped, and we were fortunate in that we never had a drop of rain while we were there. It was overcast, keeping the temperature moderate, so really ended up being the perfect day to go. As we pulled into the ferry dock, we noticed the row of brightly colored buildings, a part of "tourist village" for cruise-ship visitors. Love the Caribbean colors! However, this was not a cruise ship day, so tourist village was closed, with just some renovation work going on. The ferry terminal and small restaurants/gift shops there were clean and secure, so I was starting to feel a bit more comfortable. And then we emerged from the safety and quiet of the ferry terminal onto the streets. Wow, what a change. The closest I can come to describing it is like New York City, a seedy part of New York City. There were taxis lined up everywhere and drivers offering their services. There were a lot of men loitering around, sitting on the curbs, and since this was not a cruise-ship day, and most of the folks who disembarked the ferry with us appeared to be locals, Barry and I definitely stood out like sore thumbs or fresh meat! There was a lot of traffic, and no stoplights in this area, only stop signs, so the traffic movement seemed pretty chaotic, and it was not easy to find a good place to cross even at pedestrian crosswalks, since there were no "Walk" signals. No, Dorothy, we were not in Chapel Hill any more! We knew which streets to stay on downtown once we exited the ferry terminal and crossed the nearby swing bridge, but finding the swing bridge was more difficult than we expected. A city at street level looks just a bit different than satellite view on Google maps! Fortunately a taxi driving by (with a full load already) pointed us towards the bridge, and we were on our way. We had to wait for what seemed to be an entire school's worth of kids coming the other way on the narrow pedestrian walkway over the bridge, but we finally made our way across. The view of the sailboats in the harbor was really pretty, I thought. Again, loved the colors. Once we came off the bridge into the city, it was once again a bit of a disoriented feeling, but we figured out which street we needed to be on to get down to Brodie's, a large supermarket, only a couple of blocks down. We were happy to see a sign stating that Fri-Sat-Sun were 10% off days. Score! They definitely had a larger quantity and variety of goods than in San Pedro, but not all prices were better. Fortunately we've been shopping at various groceries on the island long enough now that we had a good idea of which items were good deals and which were not. We picked up some peanuts, olive oil, cereal, and a few other items. I was hoping that wine prices would be lower than in San Pedro, but alas, they were not, so I am still wine-free. I was also sorry to see that the price on the box of 100 bags of green tea I had just bought the day before on the island was less than half the price at Brodie's -- wish I'd waited! To the left of where I was walking was a pretty sketchy park with a lot of men loitering...I walked by quickly! As we walked along the street, a couple of panhandlers approached Barry wanting "a dolla, just a dolla man", and they were pretty aggressive about it. We just kept walking. Fortunately, we didn't have to surrender our give-away wallet to anyone. Barry wanted to explore more, but I was a bit wary of staying on the streets any longer than needed to do our little shopping, and most of the stores we passed were not appealing (blasting rap music, hoochy clothes, etc. ), so I urged him to find the bike shop we wanted to go to so we could get going back to the ferry terminal. I was afraid we would not find the street it was on, but suddenly, there was the street, and there was the bike shop, Hop Sing! Ah, the familiar smell of rubber tires made me feel instantly at home. It was a nice shop filled with cruiser bikes and a variety of parts and accessories. Very different from the high-end bike shops back in Chapel Hill, it was still a perfect oasis for us as there are no real bike shops on Ambergris Caye, just a small selection of very basic parts in a couple of hardware stores. This shop felt like an oasis in the desert to me! We purchased a flat handlebar for Barry to swap out his cruiser handlebars, and a saddle with a cutout for me. They only had low-end saddles, so it remains to be seen if this is an improvement on my big cushy cruiser saddle. I kinda need the cush, with all the bumps on the beach paths and unpaved and cobblestone roads here, but I also want a cutout to prevent chafing. I know that Serfas makes saddles that have both, so I may ultimately end up needing to buy a new saddle in the US, but I will give this one a try. It was only $19.95 Belize (around $10 US), so I'm not out much at all if it proves to be too firm for the type of riding we do here. After leaving Hop Sing, we beat a hasty retreat (at my request!) back to the ferry terminal and were offered several cab rides along the way, even just a block away. Once inside, I could let down my guard and relax after our foray into the gritty city, and the Belikin I had from this little snack bar/gift shop went down really nicely and left me feeling nicely tranquilo. We had a bit of a wait before catching the 3 o'clock ferry back to Ambergris Caye, so took a few more photos of the area while we waited. Yep, those colors are deserving of a closeup! The ferry back was packed! It was people-watching heaven. One young local gal seated near us was playing loud music on her iPod (or equivalent) without earbuds, much to the chagrin of all of the rest of the passengers near her, who were rolling their eyes at each each other. I guess she was completely oblivious that this was rude, but since she was built like a linebacker (in fact, Barry thought she was a dude! ), no one dared to say anything to her. She wouldn't have heard anyway, over her music and the drone of the three mighty outboards off the stern. Once back in San Pedro, we had to quickly walk up the beach to the nearby water taxi dock as we were within a few minutes of the next run north; if we'd missed that boat, we'd have had to wait an hour, and we were too pooped to schlep our backpacks full of heavy groceries back home. Plus we knew Paisley would be missing us and wanting some exercise. We made it with only a couple of minutes to spare and packed into a very crowded boat. On the ride north, we talked to a couple from Florida next to us who are considering a condo purchase on Ambergris Caye and gave them our card in case we could help answer any questions they might have. It's amazing how almost everyone who vacations here ends up wanting to buy property here, or so it seems, anyway! Guess we aren't that crazy after all. Today Barry installed our new bike parts. And, we are eight for eight. It didn't rain overnight, but we had a brief shower in the afternoon, a perfect record in October so far. My new saddle. The angle of the photo makes it look much bigger than it actually is -- it's much smaller than the huge one it replaced.